The White Spot collection replicates shapes that are part of Dunhill�s history, since they have all been featured in the Dunhill Shape Book, an encyclopaedic volume of all the original Dunhill designs produced. The �38 F/T�, a classic Lovat shape in group 3 size, is finished in Shell Briar, the sandblast finish invented by Alfred Dunhill. The pipe is decorated with a 10mm Sterling Silver band engraved with the �White Spot� trademark and the stem is stamped with the original code 38 F/T. F/T stands for �Fishtail� mouthpiece. 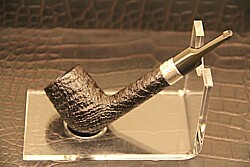 The pipe is supplied with a numbered and hand-signed certificate of authenticity.